Chicago's hippest hot dog stand helped turn the lowly sausage into a culinary superstar. Customers could order hot dogs stuffed with exotic ingredients. Like rattlesnake. But no one could have predicted what happened. Customers brought lawn chairs, card tables and poker chips to help pass the wait of up to eight hours. A spot in line popped up on Craigslist for $300. Christopher Sanders and his buddy David Kudla became Wednesday's first customers at 12:45 a.m., unfolding lawn chairs to wait for the doors to open at 10:30 a.m.
Sanders, 29, had never been to Doug's before put off, by all things, by the sight of constant but shorter lines. Sergio Deleon, who arrived at 3 a.m., knew that if he was not in his college classroom by 11, it could cost him a full grade in class. "Gonna be worth it," said the 24-year-old Deleon, though he had a plan for salvaging an A, by purchasing a hot dog for the professor. I think adding exotic ingredients reflects upon the culture of the U.S because It shows that being different is a hit and that these things are not very easy to kill and people go for those kinds of places. Places like McDonald's and other places have spread across the world because they are very big hits even without exotic ingredients but I don't think that is why I think it is because It is different from a lot of other places and it is very easy to go order a burger rather then waiting in line for hours because people don't have that much patience. But places that are different and have exotic ingredients go high on the charts because the food is hard to get as well as the food is different. It would have to be a really good hot dog for me to stay in a line all night and wait for it. People who wait all night for a hotdog are crazy. Adding exotic ingredients wouldn't effect whether it is still "All-American" food or not. It is just an add-on to a hot dog. You know it is still an All-American food when somebody sells a spot on Craigslist for $300. 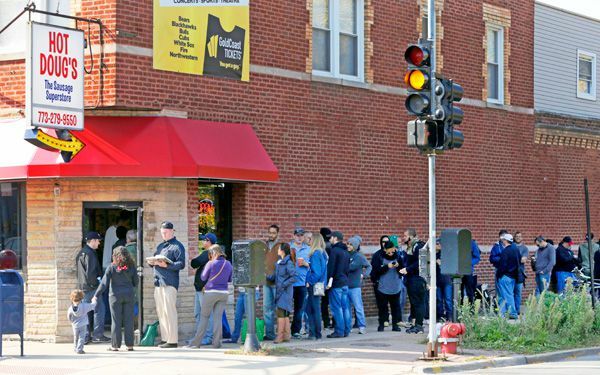 That is ridiculous I mean who would want to wait in line that long for a hot dog sure there good but I mean come on people get a hold of yourselves. If you want a hot dog that bad then just make one at home yourself. Adding exotic food materials in an Amercian food item shows that this country id very diverse. Its willing to put food items from a different country in to theirs to make it takes better. This culture America made for its self is amazing in how we put different cultures into our dishes. We are all different a this shows it. adding exotic ingredients reflect the culture because it shows that being different is a hit. Also it shows that when people really love something they will do anything to get that thing. I don't think I would wait all night in line for a hot dog unless it was a really really good hot dog. Stuffing it with exotic things doesn't seem like it is all that appetizing. I think that the idea is ridiculous that people are waiting in line all day for a hot dog. even though they are exotic, I would just go somewhere else. some people are even selling their spots online, thats just crazy. This must be a good hot dog place. if everyone is wanting to wait 8 hours in a line. this reminds me of one of the famous hot dogs place in L.A. there is always a big line and all the celebrity's go. what makes me wonder is.. how come they didn't interview customers after there purchase?